Here is a story I read the other day about a family and their son Josh which is a great example of God’s great love for each of His children. "I'm a surgeon in the Gold Coast, Australia," said the voice at the other end of the phone. "Your son is just being wheeled into surgery for a major abdominal operation following a surfing accident. I think it best that you and your wife come immediately." Such words spoken in the middle of the night would be terrifying to any parent. It was 5:40 a.m., Good Friday. 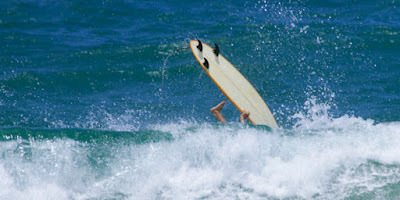 Our son, Josh, had been surfing with three friends in Australia for the preceding two months. Earlier that day, toward the end of a ride, the pointed end of the board had stuck into the sand and the blunt end dug into his stomach region, with all the force of the wave behind him. In great agony, he'd managed to crawl back on his board and swim to the lifeguards for help. The hospital had diagnosed severe abdominal injury, along with the possibility of a broken back. With the likelihood of a ruptured intestine and the resulting leak of toxins into the body, surgery wasn't an option. What can parents do upon receiving such news on the other side of the world, but to get on their knees? I thought of God's love and never-failing presence, especially comforting when feeling helpless. When Josh learned of his parents' pending arrival, he was amazed at our dedication to him, that we would fly halfway around the world to be at his bedside. On that Easter day, as I flew over the Pacific on the way to my son, I thought of our heavenly Father and the great lengths that He would go to, to be with us, holding back nothing, not even His only Son. My "sacrifice" was so small compared to His. Just as I didn't question my trip to Australia to bring my son home, so too, does the Father not question what it takes to bring each of us home, into an everlasting relationship with Him. Dear Lord, thank You for reaching out to us with open arms, with a love that we often fail to see. Thank You that you are always there for us. In the Name of Jesus, Amen.